Could this possibly be a picture taken from Silver Lake? I have one that could be its sister...I'll add it to my art collection so you can see for yourself...'course mine is very different. It was taken from a ferry on the Seattle - Bremerton route and was shot not far from Manchester. Da Mountain was especially clear that day. 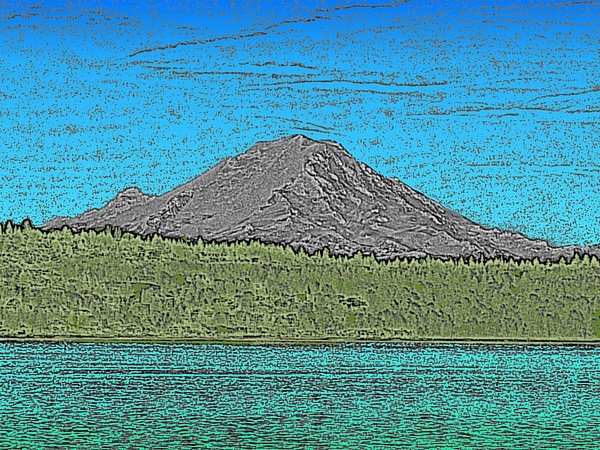 Like this Mount Ranier art design, Tim! Washington State's highest peak, Mount Rainier.